First time vacuuming – three years after we moved in! Cleaning is not my favorite thing to do. In fact, it is something I dislike so much that I am willing to pay someone else to do it, which is exactly what I did until recently. It was decided that since I am now home more that there is no need to pay someone else to clean our house. I must have been daydreaming during this decision making process because there is no way I would voluntarily agree to get on my hands and knees and scrub my kitchen floor. I literally have a recurring nightmare about cleaning the toilet and the cleaning brush flicking little bits of toilet scum into my mouth. I would never knowingly bring this nightmare to fruition. All I know is one day my cleaning lady was no longer coming to the house after my husband talked to her. 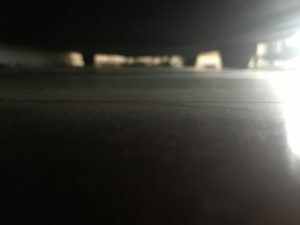 Since dust bunnies were multiplying and nobody seemed to be doing anything about it, I finally came to the conclusion that I was the somebody that was supposed to be doing something about it. All I could think is there had to be someone more qualified for this job than me. Growing up I helped clean the house every weekend. My job was to dust. It apparently seemed like the appropriate job for a child who was allergic to dust. I think my mom knew better than to put a piece of metal in my hands and send me to push it around the house banging into furniture. I have blamed this childhood chore for my dislike of cleaning since the first time I had to clean my own house. I know this is a fallacy, but I am holding onto it with both hands. Freud may have been wrong about a lot, but he had a point with his theory that everything is mom’s fault. It can’t possibly be my laziness and sense of entitlement that has caused this extreme distaste for cleaning my own house. One of my least favorite things to do is vacuum. It doesn’t seem like it would be a hard task to accomplish, but my track record with vacuum cleaners is not good. I once stood in the driveway with our little compact vacuum trying to find the power switch for about twenty minutes. I was attempting to clean out my car with little luck. If I couldn’t even turn the thing on, I clearly was not meant to operate the device. I took that experience as a sign to abort all future missions with vacuum cleaners. When you vacuum once a quarter, the bag looks like this! The next time I used this compact vacuum cleaner, the only vacuum I ever used since I moved in with my husband over fifteen years ago, was when my daughter was a toddler. My husband grabbed his phone and took a photo since he was pretty sure it was the first and last time he would ever see me use the vacuum. He even called my daughter in so they could watch me. It was apparently like watching a monkey use a tool for the first time. His positive reinforcement was not going to work on me though. I didn’t pick up another cleaning gadget for years. Last week something brushed up against my leg while I was walking up the stairs. Since we no longer have a cat, it scared me more than a little. I turned around to see a dust bunny hopping down the stairs looking like a tumbleweed blowing through the desert. The time had finally come for me to attempt this cleaning thing again. Two days later I dragged out the vacuum that I had banished to the guest bedroom closet. I was pleased to see the power switch right near the handle. That cut a good half hour off my cleaning time right there. I plugged the vacuum in and started pushing it around my office, but all it did was push the little bits of paper and fuzz around in circles. It wasn’t picking anything up. I turned the machine off and looked at my husband throwing my hands up as I said “it’s broken. This thing doesn’t work.” He just laughed and told me that the bag was probably full. I gave up and went downstairs. After another two days I decided to figure out what this full bag situation was all about. I know that vacuums contain bags, I have even ordered said bags online. What I didn’t know was how or when you need to replace a bag in a vacuum. Apparently now was the time and I was going to figure out the how of it. I dragged the vacuum down the stairs, expecting this project to be messy. I was correct in my assessment. 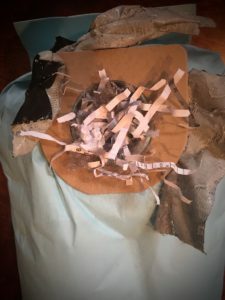 When I opened the front door and pulled out the bag, a cloud of dust exploded from the hose and globs of shredded paper poured out. To say the bag was full was a bit of an understatement. The bag was ready to blow, which may explain why the top of it was duct taped to the inside of the vacuum. Somehow I managed to attach the new bag to the hose, put the vacuum back together and drag it back upstairs to finally get to work. I swear people live in this house! After four days I was finally prepared to vacuum the portion of our house covered in carpet. I plugged in the vacuum and started pushing. This thing was fancy – it even had a light on the front, you know, for late night vacuuming. Heaven knows when I can’t sleep the first thing that comes to mind is cleaning. I pushed the vacuum through my bedroom feeling victorious for all of ten seconds before the vacuum turned off. No warning alarms, no sucking up half of the curtains, it just died. I checked the switch which was turned to the on position. I even plugged it into another outlet thinking it could have been the power in the house, but nothing happened. No light, no sucking, no nothing. I pushed the vacuum right back to it’s home in the closet and returned downstairs. This settles it – I am not destined to clean. Luckily my daughter has decided that cleaning is fun. Let’s just hope she is not allergic to dust! My Mom has a bell that sits on a table in her family room. Last month my daughter was playing with it and my husband started saying “bring me my chair!” My daughter, of course, looked at him like he was crazy and went about her business. After he said this three times, she finally asked what he was talking about. I shared the fifteen year old joke with her. 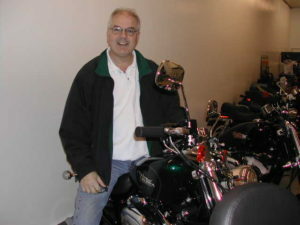 My dad got out of the hospital as quickly as he could after his accident. He spent a week in a room with an elderly man that continually rang the nurse demanding “where’s my pain pill? 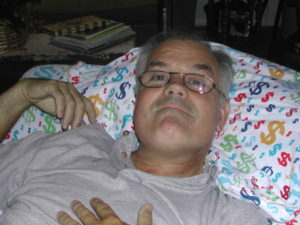 !” My dad dislikes nothing more than whining, so his patience was tested the entire time he was in that hospital bed. I think ditching his roommate was his biggest motivation for being discharged next to being able to eat ice cream directly out of the carton at midnight. He was brought home in an ambulance and took up residency in a hospital bed in my parents’ family room for the next several months. He was home, but immobile with pins and a halo around the front of his body. My mom gave him the little gold bell to ring when he needed anything. The little golden bell has been a staple in my parents’ house for as long as I can remember. When I was sick as a child, my mom would get me all tucked in on the couch and put the bell on the table next to me. I was plagued by stomach issues as a child so I am guessing the bell was just as useful for my mom to be able to get ahead of a mess. Unfortunately, I normally rang the bell after I barfed all over the floor. Luckily my dad used the bell more timely than I did as a child. My dad was a really easy patient. He rarely asked for anything while he was recuperating. Mostly what he asked for was for people to stop asking him what he needed. The one thing he did need from us was to bring him his “chair” which was really a commode. When you are laid up in a hospital bed for weeks there is not a lot to do other than eat, read and watch television. Fortunately for my dad, my mom provides comfort on plates and she cooks when she is stressed. Because of this, my dad probably ate more in those few months than he did in the year prior. Unfortunately for me, the more you eat, the more you poop. I spent my afternoons bringing my dad’s chair over to his bed and leaving the room multiple times. After awhile my mom and I started a little battle with each other. She fed him chili the night before I came to sit with him and I brought him tacos for lunch. My poor dad’s digestive system was a pawn in our poop war. He even joined the battle one night when he finally succumbed to taking a pain pill but mistakenly took a stool softener. We all lost that battle – repeatedly. I don’t know where the bell originated from, but it has always been a part of being sick or injured. 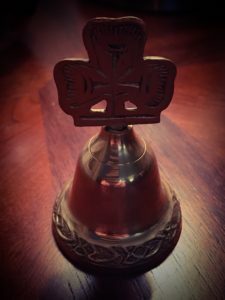 Much like a warm blanket and soft pillow, the bell is a source of comfort. It sits on the table unnoticed until the patient’s fever hits 101 and then it is delivered on a little tray with a glass of orange juice. It’s a wonder the bell at my parents’ house still rings after my daughter got her hands on it. She could take some lessons in good patient etiquette from her grandfather. As most traditions do, this one spread – to my house. The Easter Bunny brought me my own bell in my basket this year. It was quickly claimed by my daughter who has been using it to request breakfast on the couch most mornings. She is not really a traditionalist and has decided that if the bell is good enough for sick days, it is good enough for ALL days. She rings that little sucker when she wants her tray of food brought to her and again when she wants the tray cleared away or when she wants a fruit refill. The kid has a pretty charmed life. I’m the bumblehead who keeps coming back every time the bell rings. I’m like Pavlov’s dog without the drool. When she can tell I am getting a little irritated by her demands she waits until I am halfway out the door and yells “BRING ME MY CHAIR! !” It gets a laugh out of me every time. My friend texted me the other day that she got a new car. She didn’t notice her new license plate until she was approaching her car from the rear at Costco. 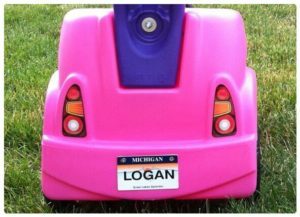 The license plate began with “BJ” which made her want to drive right back to the dealership and return the car. I told her it wasn’t that bad. Well, unless it ended in “QUEEN” or started with “FREE”. She kept the car. I have seen a lot of interesting vanity plates over the years. I have never had one, and I have a feeling that they wouldn’t print anything I would want my plate to say. I remember spending some time in Washington DC and being amazed at the amount of vanity plates. It made sense with all the politicians and their over-inflated egos. Of course people had to know who they were, even if it took a license plate to give them their proper recognition. Maybe it is trendy with the transplants. Some of the plates I had to look at for a full minute before I could decipher what they were trying to convey. None of the plates were comical or ironic like the ones I like to see. I didn’t even see a single “POLILOSER” or anything similar. Boring. In the city I live in, I don’t see very many vanity plates, but when I do they are actually pretty helpful to me. I can pull up next to the plate that says “Shriya” and yell “Hey Shriya, congratulations on your first time driving a car. It only took you two and a half minutes to navigate that turn and you almost missed that mailbox!” I feel it’s nice to call people by name when you can. A thumbs up is also appreciated. Sometimes they even return a hand gesture, but that is usually from a driver with the “MYTOY” or “VETTEGUY” plate. I was behind a car a few years ago that had a vanity plate that read “HOTTIE2”. I guess “HOTTIE1” was already taken. I thought I was behind a beauty queen runner up but when I pulled up beside the 1998 Cavalier, there was a 90 year old man peering over the steering wheel. Hottie 2 indeed. Maybe he meant Hottie World War 2. Either this old guy had a wicked sense of irony or he had borrowed his granddaughter’s car. Either way, I liked him. His granddaughter probably got that plate thinking it would prevent people from asking to borrow it. Well played old dude. He got a thumbs up which immediately caused him to swerve into the curb. My family was driving a month ago headed north to go visit my Grandmother. 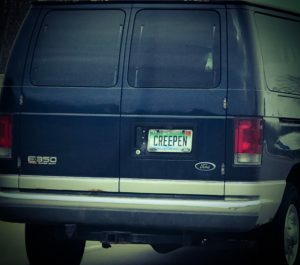 We pulled up next to a van with a plate that read “CREEPEN”. 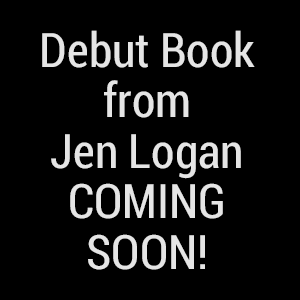 It was a dark van with tinted windows in the back. All it needed was a sign on the side that said “FREE CANDY” to complete the look. It would have been funnier if it wasn’t in mid-Michigan where the movie Deliverance could be considered a documentary. The van was full of a group of college guys. Now I am really hoping the plate was meant to be ironic. If not, it is at least a great public service announcement. It got me wondering if “CREEPER” or “CREEPIN” were already taken. If not, I may have found my vanity plate. They are going to love me when I pick up my 7 year old from school! Not surprisingly, I wrote this piece while listening to some punk rock. Die, Die My Darling by the Misfits of course!